Artwork details: two drawings in pencil, 6.5 x 6.5 inches (17 x 17 cm), 2005. They were conceived as a pair of drawings, framed separately but to be hung one above the other (though of course they should be staggered so that the telephone cable approximately lines up, not like they are shown here. Scroll down to see both. The labels part one and two are arbitrary - the picture of the devil earned the suffix of 'part 1' only because it was finished first. 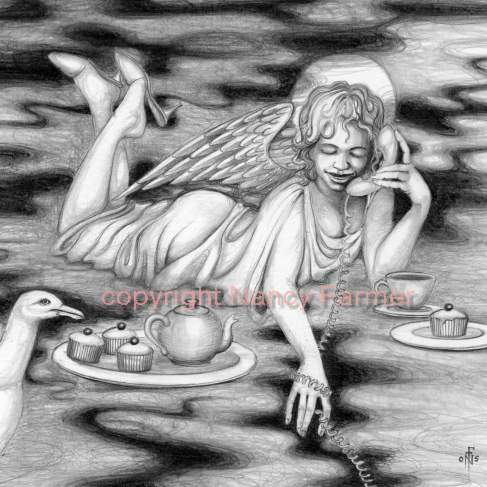 You must remember that Angels and devils are all related, and despite their differences, do like to keep in touch and keep up with the latest gossip about what's going on in 'the other place' as they say in parliament.